A video that shows Sto. 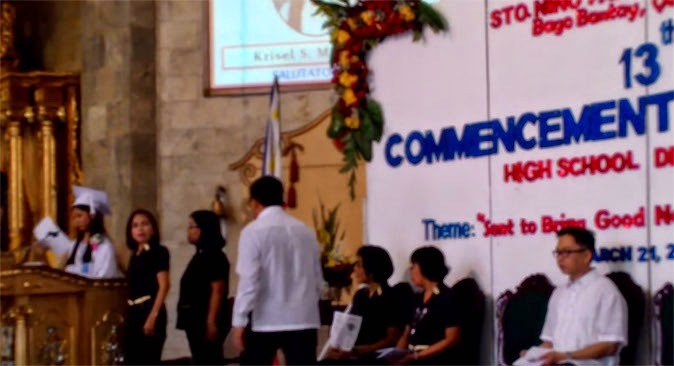 Niño Parochial School salutatorian Krisel Mallari being interrupted while delivering her speech has gone viral online. In the video published Saturday, March 21, on YouTube, the class salutatorian was in the early part of her address when the master of ceremonies suddenly thanked her. Krisel continued after pausing for a moment, but the emcee kept on interrupting her, saying the order for her to stop and take a seat came from the principal. At one point, a teacher seemingly handed her a paper to replace what she was reading. It also looked like the teacher was trying to confiscate the original script, a copy of which was posted on YouTube. In an interview with ABS-CBN News, Krisel confirmed that she delivered a speech—about an alleged cheating incident in the school—which was different from the one approved by school authorities. The honor student said she wanted to express what she thought was right, believing that there's "freedom of speech." Her sister, Katherine, revealed that prior to the graduation rites, their father, Ernesto, had gone back and forth for five days asking the school to release the computation of Krisel's grades for the sake of transparency, but to no avail. She said Krisel has become the voice of those who experienced a similar case in the past. According to her sister, Krisel Mallari was supposed to receive the Best in Religion award, but the parochial school did not pursue in giving it to her because of the salutatorian's speech. Concerned netizens have called for the investigation of the incident.